After the extreme severe epidemics in 2010 and 2011, the potential wheat stripe rust damage was less, but still substantial in 2012 and 2013 in the Pacific Northwest (PNW). In 2010, wheat stripe rust was a big national problem as the disease had the most widespread distribution and caused the most widespread use of fungicides and the highest estimated yield loss (95.77 million bushels or 4.76%) in the recorded history. In the PNW, potential yield loss on susceptible cultivars were determined to be over 60%, reached the extreme severe level in the experimental field. In the State of Washington alone, growers spent about $27 million on fungicide application, which saved about 13.7 million bushels of grain, worthy more than $96 million. The major fact causing the big epidemic was the long period of cool and wet weather conditions in the spring and early summer in states east of the Rocky Mountains as well as in the west. In 2011, the nationwide stripe rust epidemic was not as bad as that in 2010, causing about 35.25 million bushel yield loss. The low disease epidemic was mainly due to the widespread drought conditions in states east of the Rocky Mountains. However, the stripe rust epidemic in the PNW was the most severe probably since 1981. The potential yield loss was determined to be more than 90% on susceptible winter wheat varieties and about 45% on susceptible spring wheat varieties. Fungicide application cost growers more than $30 million, which saved more than 20 million bushels, worthy more than $136 million in the State of Washington alone. The extremely severe epidemic of 2011 in the Pacific Northwest can be attribute to: 1) the delayed 2010 wheat crops and stripe rust season due to the cool and moist weather conditions provided huge amount of viable rust spores into the fall, 2) unusually severe and widespread infection in the fall of 2010 due to the heavy spore load and the unusually high moisture condition in September and October, 2010, 3) high survival due to the relatively mild winter and especially the snow cover during the cold spells, 4) therefore, the unusually early start of stripe rust development basically right from every winter wheat fields, and 5) the consequent usually long rust season, which caused devastating damage on susceptible and moderately susceptible varieties. 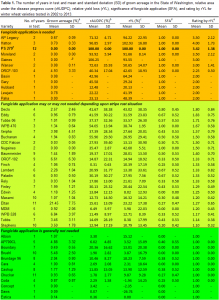 Even moderately resistant varieties had significant yield losses. The 2012 and 2013 epidemics were less severe than those of 2010 and 2011, but still significant. In 2012, stripe rust caused 57.5% yield loss on susceptible winter wheat varieties and 35.9% on susceptible spring wheat varieties; and in 2013, the yield losses of susceptible varieties were 34.2% for winter wheat and 20.1% for spring wheat. Commercially grown winter wheat varieties would have had yield loss of 16% in 2012 and 10% in 2013; and spring wheat varieties would have had yield loss of 27% in 2012 and 6% in 2013 on average if fungicides had not been used. All these figures are higher than the average of the last decade from 2002-2013, except spring wheat in 2013. On average, stripe rust caused yield loss of 43.71% on winter wheat and 32.80% on spring wheat of the susceptible checks; and 8.47% on winter wheat and 12.74% on spring wheat of commercially grown varieties over the last 12 years if fungicides had not been used. From 2002 to 2013, extremely severe epidemics (>60% yield loss on susceptible checks) occurred 2 times (2010 and 2011), severe epidemics (40-60%) occurred 3 times (2005, 2007, and 2012), moderate epidemics (20-40%) occurred 7 times (2001, 2002, 2003, 2004, 2006, 2008, and 2013), and low epidemics (<20%) occurred 1 time (2009). The variations in epidemic levels were mainly caused by the different weather conditions and variety changes. In 2012, the disease started about one week later than normal, but still developed to a severe level due to the relatively favorable weather conditions in the late spring and summer. In contrast, rust started earlier than normal in 2013, but the hot and dry weather conditions in the late spring and summer stopped the development. 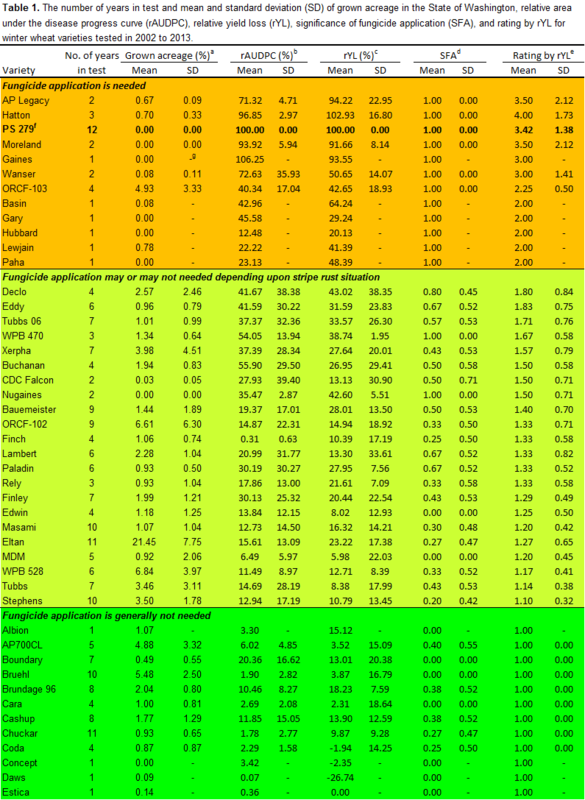 It was great to see some highly resistant varieties becoming dominant. For example, ‘Bruehl’ was still the No. 1 variety for club wheat and ‘Cara’ had increased acreage and Norwest 553 became the No. 1 hard red winter wheat variety in 2013. For spring wheat, highly susceptible varieties such as Hank and WBP 926 disappeared; and highly resistant variety Expresso became the No. 1 hard red spring variety and Diva became No. 2 soft white spring variety. The increased acreage of resistant varieties contributed to the low level of epidemic in 2013, especially in the spring wheat crop. Stripe rust is mainly controlled by growing resistant varieties and applying fungicides when needed, but cultural practices can play a significant role in the disease management. Early planting of winter wheat, coupled with not-so-common high moisture in late summer and fall, produces big plants which can catch rust spores in the air for infection. For example, severe stripe rust was observed in November in the Horse Heaven Hills in 2010 (Fig. 1). In the last two years, we gladly noted that most wheat fields in this area were planted later than the past, likely contributing to the low rust level. 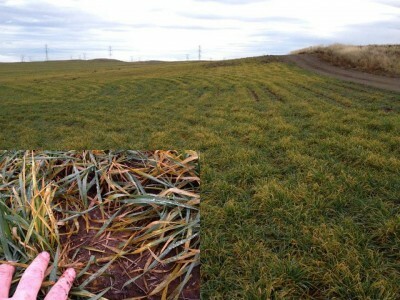 On November 11, 2013, we were checking fields in Horse Heaven Hills, the Connell and Ritzville areas, we did not find any stripe rust. However, on November 14, we received a report of heavy stripe rust in a field of ‘Eltan’ planted in the end of July (Fig. 2). Early planting of winter wheat produces huge amount rust spores for infecting wheat crop in more fields before winter, and rust mycelia within leaves can survive as long as the infected leaves survive the winter. Therefore, a good practice is not to plant too early. For any reasons (such as for cover crop, forage or graze) a field needs to be planted early, it will be better to select varieties (such as winter wheat ‘Bruehl’ and ‘Cara’, and spring wheat ‘Clear White 515’, ‘Dayn’, ‘Expresso’, ‘Lassik’, ‘LCS-Buck Pronto’, and ‘Patwin 515’) with effective all-stage resistance. Genetic resistance is the most reliable approach to control stripe rust. In recent years, we have identified Yr45, Yr53, and two to-be-named new genes for effective all-stage resistance; and Yr52, Yr59, two to-be-named new genes, and more than 10 small-effect quantitative trait loci for durable high-temperature adult-plant (HTAP) resistance. We have developed more than 70 new stripe rust germplasm lines mostly with different resistance genes and provided the genetic stocks to breeding programs. For breeding programs, it is still better to develop varieties with high level HTAP resistance or combining HTAP resistance with effective all-stage resistance into individual varieties. To keep tracking which all-stage resistance genes are effective and which ones are not, we continue monitoring their reactions in fields and use a newly established set of single-gene lines to differentiate races of the pathogen. Fungicide application is recommended only when needed. Highly resistant varieties do not need fungicide application. 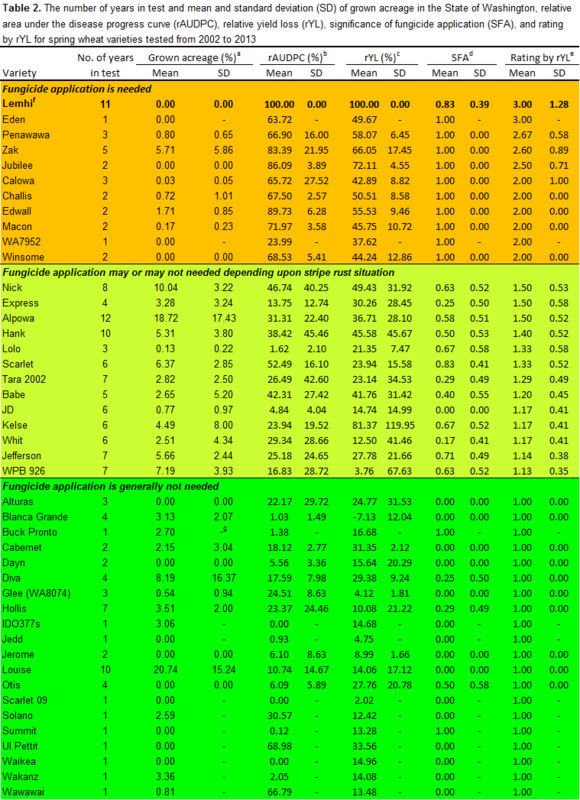 Commercially grown varieties and newly developed breeding lines were characterized into three categories: 1) fungicide application may be needed, 2) fungicide application may or may not be needed, and 3) fungicide application is generally not needed based on their resistance/susceptibility to stripe rust and response to fungicide application (Table 1, Table 2). If varieties in the first group are planted, at least one application of fungicide is needed almost in any growth season. Fungicide application may be needed or not needed depending upon rust pressure if varieties in the second group are grown. Growers are encouraged to choose varieties from the third group as these varieties generally have adequate resistance. We do not recommend fungicide application for other controversial arguments, such as “fungicides have plant vigor effects” or “increase yield”, because our experimental data do not support such questionable “beneficial” effects. In the experiments conducted during the last 12 years, we observed 53 variety-tests with decreased yield (on average 2.65% decrease) and 66 variety-tests with increased yield (on average 3.50% increase) for winter wheat after fungicide application. None of the decreases or increases is statistically significant, and the comparison of the increases with the decreases does not show statistical significance. In the spring wheat experiment, we observed 17 cases of yield decrease (on average 1.24% decrease) and 41 cases of yield increase (on average 5.73%). However, none of the single cases is statistically significant. Even the comparison of the two group shows significance, much of the yield increase should be attributed to reduction of rust severity. Obviously, fungicide application adds additional costs and possibly reduces yield in the wheel tracking stripes if grand application is used. In our experiments, we rarely saw significance of other diseases. 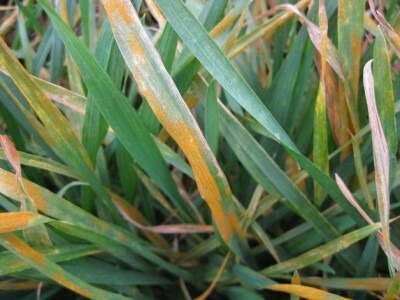 In states east of Rocky Mountains, other foliar fungal diseases, such as leaf rust, powdery mildew, Septoria leaf blight, tan spot, and Fusarium head blight (FHB or scab), can occur together with stripe rust or in a sequential order, application of fungicides for control of stripe rust may take the potential of other diseases into the consideration. In the PNW, these diseases generally do not cause significant problem. Fungicide application may be considered when both stripe rust and another disease(s) start developing. In recent years especially 2013, FHB has become significant in the irrigated regions, probably due to the increase of corn production. The best timing for control of this disease is applying fungicide just before or during flowering, and considering both stripe rust and FHB to make decisions of fungicide application can be a good idea. Whether foliar application of fungicides has any effect on soil-borne fungal pathogens, explaining yield increase when stripe rust is not significant, requires tests of the fungicides as foliar application to control soil-borne diseases. If a resistant variety is grown, – not apply; if a susceptible or moderately susceptible variety is grown, – next. If active rust is observed even at a low incidence level (apply); if not observed – next. Rust is reported in the nearby regions (e.g. within the eastern PNW) and infection will likely occur within a couple of weeks, – apply; otherwise wait until rust is found in the field. Mixing a fungicide with an herbicide reduces application cost and is effective if the stripe rust fungus has well over-wintered. For example, this was necessary in 2011 and 2013, but not necessary in 2012. About three to four weeks after fungicide application, second fungicide application may be considered when rust starts re-developing. In the eastern PNW, stripe rust often starts developing at boot to heading stage and one application at this time usually control stripe rust. At this time, HTAP resistance usually works unless the weather conditions are too cool and wet like 2010 and 2011. 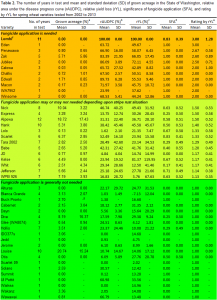 To apply or not apply fungicides will depend upon variety resistance (including HTAP resistance), real-time rust situation in the field and the region, and weather conditions in following weeks based on forecasts. To reduce costs, protect people using chemicals and living in surrounding areas, and reduce pressure for selection of potential chemical-resistant rust strains, it is always a good idea to reduce unnecessary use of fungicides. For keeping up with stripe rust information including disease lifecycle, pathogen races, resistance, fungicide efficacy, forecasts, updates, specific recommendations, management strategies, various nursery data, literature, and research progress, please check our website https://striperust.wsu.edu, periodically. We welcome any suggestions for enhancing the website.